In today’s world, the act of pulling out your phone, taking a picture someplace, and posting it for your friends on Instagram is a significant action. It means in that moment, whatever you’re doing, in whichever place, is inspiring to you, and you want to remember it. While Instagram data can’t tell us the actual economic impact of a location, it is a huge indicator of what’s providing value to people and driving excitement, fun, and interest in a region. In a region as sprawling as the Catskills, that’s experiencing so much change, Instagram data can provide a lot of context. So we compiled over 200,000 geo-tagged Instagram posts from the last year in the region, and measured which places are getting photographed the most (minus pictures by businesses themselves or their owners/employees). If your goal is to be on this list next year, we can help! We’re a creative and strategic marketing agency that offers branding, marketing campaigns, and website design & development. We harness social media and search data (like in this post) to help us do the most effective creative work. Check out some of our past projects. Onto the list! Note: this list focuses on the Catskills as a region west of Saugerties, Woodstock, and Kingston, which we’ve covered in previous posts. There’s a small amount of overlap with our previous post covering the Hudson Valley, but not much. Hunter – Hunter Mountain made our Hudson Valley list last year with 5,200 photos. The reason for the increase? We rolled in some of the festivals that take place here, like Mountain Jam, Taste of Country and TAP NY. In addition to being a ski resort, Hunter Mountain also features lots of hiking trails and the highest fire tower in New York. Hunter – Hunter going two for two! The falls are considered one of America’s oldest tourist attractions. 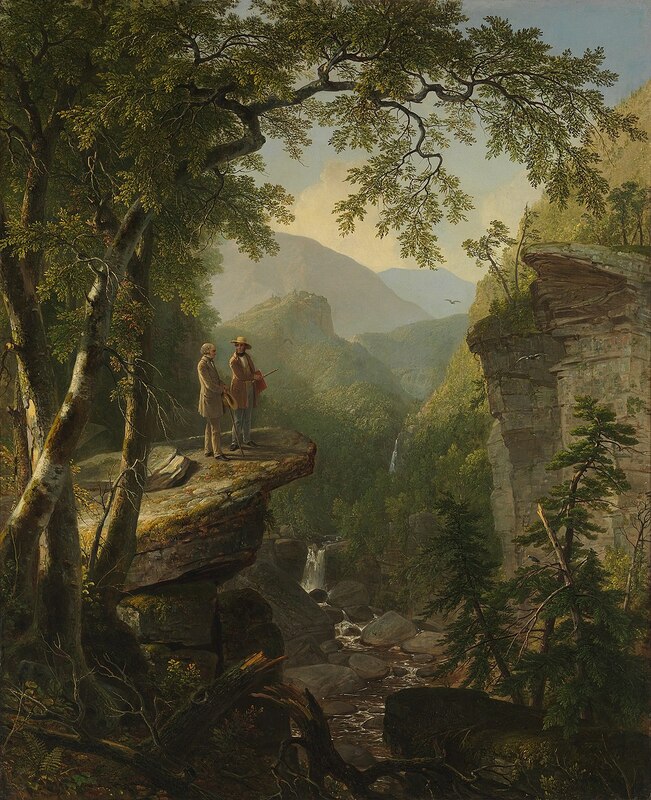 In the 1820s, “Catterskill” went viral when they were name-dropped by Washington Irving in “Rip Van Winkle.” This inspired a movement of artists like Thomas Cole to flood into town, determined to make their own paintings of the falls, the most famous of which is Kindred Spirits. The falls are so beautiful that dozens upon dozens of people have died here over the last 200 years, just trying to get the best view. So the next time you hear people complaining about social media ruining our natural attractions, feel free to say “Well actually…” The more things change, the more they stay the same. Oneonta – You could say Oneonta is a college town; their total population is 14,000, and SUNY Oneonta has about 8,000 students, while Hartwick College has another 1,500. Their students get an education that is consistently cited as one of the “best values” in the country, and the 250 acre campus has lots of beautiful outdoor views for Instagram photos, like College Camp and the New York State-shaped pond. Windham – It’s been a ski destination since the 1960s, and in the off-season, is home to lots of events, festivals, yoga retreats, weddings, and hikes. One cool thing: the slopes are also home to the Adaptive Sports Foundation, which provides outdoor experiences and support to individuals with physical and cognitive disabilities and chronic illnesses, and also prepares athletes for the Paralympics and Special Olympics. Bethel – This is where Woodstock actually happened. In 1996, the founder of Cablevision sold off his company to Time Warner Cable, and started the Gerry Foundation, whose mission it is to revitalize the economy in Sullivan County. Their first move was to purchase Max Yasgur’s farm where Woodstock took place, as well as close to 2,000 acres surrounding it, with the goal of creating a world-class performing arts destination. In 2006, their amphitheater was launched with a performance by the New York Philharmonic, in 2008, the Musuem at Bethel Woods opened, and in 2013, a separate Conservatory program was launched to foster youth and teen educational programming. Olivebridge – We wrote up Ashokan Reservoir in our post about the Hudson Valley last year. Since then, a proposed 11.5 mile rail trail along the water is in some stage of happening. In 2018, it is expected that a rail bike experience will launch along the trail as well, via Rail Explorers. Cragsmoor/Ellenville – We also wrote up Sam’s Point last year. What’s new? In October, the Open Space Institute acquired an adjacent “South Escarpment” property which they say will enhance trail access to Sam’s Point and the ice caves. If that means that there will be a second place to park to get to the preserve, that would be awesome. Glen Spey – Young Life is a Christian ministry that was founded in 1941; today, they count over 7,000 ministries in schools and other outreach locations, along with 72,000 volunteers. They operate 17 summer camps around the world, and Lake Champion is one of them; they offer week-to-week camping experiences for both children and adults, as well as retreat experiences. In June, they hold a “Work Crew Welcome” where campers celebrate the volunteers and employees making everything happen; this video from last June is one of the most joyous things we’ve ever seen. Highmount – Belleayre is the non-profit, Ulster County counterpart to Hunter and Windham Mountains, which are for-profit operations in neighboring Greene County. Together, they form a triumvirate of ski destinations in the Catskills that drive year-round activity thanks to off-season festivals, races and hiking trails. Belleayre also has a beach. Hunter – A mile from Hunter Mountain’s ski resort, Scribner’s is a 38-room boutique hotel that was converted from a motor lodge and opened in October of 2016; it’s already at #10 on this list. There’s a lot to do nearby, but visiting urban explorers can spend an entire week on the 20-acre property and not get bored; there’s an on-site, locally-sourced restaurant, Prospect, lots of fireplaces and decks, and events like the upcoming Cider in the Mountains festival. Big Indian – Catskill Park is a catch-all name for a 700,000 acre area that is in parts of Ulster, Sullivan, Delaware and Greene counties; it’s home to parts of the Esopus Creek, Neversink River, Rondout Creek and Schoharie Creek. Within it is the Catskill Forest Preserve, which has 287,000 acres of land where hiking, camping, hunting, fishing, biking, rock climbing, canoeing and snowmobiling are permitted; there are also 18 family-friendly hikes. Our business development director Todd spends lots of time fishing in Catskill Park with Esopus Creel, his fly-fishing guiding company which was just written up in And North. Phoenicia – The diner came in at #16 on our Most-Instagrammed Places in the Hudson Valley list. Since then, they’ve also opened The Lot: an outdoor seating area open from 9-4 Fridays through Sundays that serves espresso, pastries and take-out food with live music and other one-off events. Mount Tremper – Foxfire came in at #45 on our Hudson Valley list last year. They’ve now opened the Foxfire Bar Room, which like The Lot, is a cozy, weekends-only extension of their main business. It’s a great way to get a little taste of Foxfire. Oneonta – This college started near Cooperstown in 1816, and moved to Oneonta in 1928 when the city donated land for the campus. One of the main attractions for Instagrammers is the Pine Lake Environmental Campus, which is a nearby 300 acre alternative campus that that has a lake, disc golf course and hiking trails. Haines Falls – This is the place to be if you want to camp, hike, check out Kaaterskill Falls, and go swimming all in the same weekend. Tannersville is a few miles away, too. Big Indian – Located a half hour west of Woodstock in the Catskill Forest Preserve, Full Moon hosts lots of barn weddings, conferences, retreats and music camps while also operating a bed and breakfast and cafe. There’s even the Full Moon Road House, which doubles as a wedding afterparty spot and intimate music venue with great sound for local gigs. Claryville – There is almost an overwhelming amount of stuff going on here. Primarily, Frost Valley is known for its summer camp program where kids can participate in things like the Bear Grylls Survival Summer Camp, a horse camp, a farm camp, and even a camp that hosts kids from Tokyo. The grounds are also open for disc golf, fishing, hunting, hiking, retreats and camping trips, cross country skiing, and environmental research. I wish they had a survival camp for adults. Callicoon – Villa Roma is a throwback; it’s one of the last surviving all-inclusive Catskills resorts, and if its place on this list is any indication, they’re going strong. Some of their top draws according to Instagrammers are their indoor and outdoor pools, live events and horseback riding. Grahamsville/Denning – One of the most picturesque swimming holes in the entire country, the Blue Hole received national attention this summer for being named a “hot spot” by the Leave No Trace Center for Outdoor Ethics, citing an increase in trash, damage to vegetation and trees, and trail erosion. They have regularly have “Take Back the Trail” clean up events where trash bags and refreshments are provided; the next two will be held on September 15 and September 30. And by “they,” we mean the partnered effort between the NYSDEC, the New York-New Jersey Trail Conference, Catskill Conservation Corps, Catskill Center and Adirondack Mountain Club. Roxbury – This is Delaware County’s prime ski destination; in the off-season, they are host to lots of weddings and mountain biking excursions. One cool thing is that they partner with local startup Tentrr to offer glamping and camping on their grounds. Ellenville – Another example of a surviving and thriving resort in the style of the Catskills’ glory days. It combines a 230+ room hotel with conference and event facilities, a spa, indoor and outdoor pools, a golf course, and 200 acres of trails and outdoor exploration. 22. The Graham & Co.
Phoenicia – They were #40 on our list from the Hudson Valley; a few months ago, they were cited by the NY Times as one of three “hot spots” for Independence Day, and it was noted that guests get a complimentary Budweiser on arrival. Mount Tremper – There’s a lot of history here, and looking into the origins of the Emerson is like looking back into the last 25 years of the Catskills. In 1994, a fascinating report came out titled “Resource Protection and Economic Development Strategy for the Town of Shandaken, Ulster County in cooperation with the Town of Middletown, Delaware County.” Long story short, it said that new investment in tourism would be the economic engine that would deliver the Catskills from the hangover of the Borsch Belt years. The chairman of the Route 28 Corridor Committee was a entrepreneur and transplant to the area named Dean Gitter, who two years later, did exactly what the report recommended: he acquired a former ski shop, restaurant and hotel complex on Route 28, and opened a new tourism complex called Catskill Corners, with an added twist of a $250K “World’s Largest Kaleidescope” designed by stained glass artist Charles Karadimos. Over 20 years later, it’s still one of the anchors of the Catskills tourist economy. Narrowsburg – This campground is part of a larger, family-owned business called Landers River Trips. which is dedicated to helping people go rafting, canoeing, kayaking and tubing. The grounds are also home to some music festivals, like The Mystery Landers and Froggy Daze, and was the scene of a really cool meetup by Babes Ride Out, which held a ladies-only motorcycle ride and campout there. Boiceville – Fodor’s Short Escapes called this “one of the most beautiful locations of any B&B in the world.” This picturesque wedding destination was literally built with mayonnaise money; the Hellman family (of Hellman’s Mayonnaise) built up this estate in the 1920s and 30s to serve as their home in the country. Olivebridge – The Ashokan Center is the oldest outdoor environmental education organization in New York State; it’s set on 385 acres of fields, forests and streams. They’re home to several retreats and conferences, as well as events like the Summer and Winter Hoot and Maple Fest. Livingston Manor – A nine room hotel on top of Shandelee Mountain, this is one of four Catskills hotels and inns run by Foster Supply Co., which also lays claim to the North Branch Inn (North Branch), Nine River Road (Callicoon) and The Debruce (Livingston Manor). In addition to the b&b, there’s a tavern open to the public, lake house, spa and is home to lots of beautiful weddings. Loch Sheldrake – Every summer, a group of close to 600 campers put on a total of 40 Broadway shows, with about a third of them happening every three weeks. Thousands of graduates have gone on to varying degrees of success in film, TV and theater; including Robert Downey Jr., Natalie Portman, Zach Braff and Jon Cryer. Andes – Wayside was featured in our Most-Instagrammed Cideries in New York State post. Loch Sheldrake – This community college has around 1,000 undergraduate students, and based on Instagram, they seem to have a thriving athletic program. They recently appointed a new president who has an interesting story: he failed high school English, never graduated high school, but eventually got a GED and began pursuing a career in education, working with the Governor’s education office before becoming the acting president of SUNY Sullivan. Also of note: SUNY Sullivan is one of four state colleges participating in New York State’s Industrial Hemp Agriculture Pilot program. Wawarsing – Located on the northwestern edge of the Minnewaska Preserve, this is a lesser-known waterfall hike that’s an easy alternative to the crowds at Kaaterskill. It’s a 90 foot waterfall, and our friends at Hike the Hudson Valley say it’s only 1.5 miles up and back. It also links back to the Minnewaska Preserve, so you could get into the park that way. Catskill – The farm opened in 1933 and hosted over 2,000 animals in its time on close to 1,000 acres; over the years, it accumulated a wealth of vintage amusement park rides and kitschy sideshow games and attractions. It closed in 2006, and was in a state of decay until recently; new owners are taking the Farm into the next stage of its life. They’re in the process of building a wedding venue/inn and museum, and in the meantime, they’re holding cool one-off events and offering camping via Tentrr. While you camp, you can explore an abandoned zoo, which sounds like a very unique (and at nighttime, frightening) experience. East Jewett – This is the expert mode alternative to North-South Lake. The Daily Freeman described it as a “primitive campground” that offers a more barebones experience just outside of Tannersville. There’s a parking lot and a fishing platform. That’s all you get. Oneonta – This is where all the college students from SUNY Oneonta and Hartwick College hang out. They often have specials like $1.50 drafts and free food a couple of nights a week. Of note: they are famous for their “t-shirt challenge”, where you can pay a flat rate to drink 10 beers or 4 vodka-lemonades to win a free t-shirt of your choice. You can feel the hangover through your screen right now! They have a sister location in Cortland, and a new location opening in Brockport soon. North Blenheim – Schoharie County isn’t left out of the waterfall party; the 80-foot tall Mine Kill Falls are on this 500 acre state park. There’s fishing, snowmobiling, hiking and biking on 6.5 miles of trails, and swimming in the park’s Olympic-sized swimming pool. West Kill – One of the most notable experiences available in the Catskills is offered here; it’s a property that started as a Dutch Farm and was once owned by Arnold Schwarzenegger. It’s a ten room “bed and bar” that offers idyllic summer weekends in the middle of nowhere, complete with fire pits, fancy hot dogs and whiskey. Of note is their artist residency program, where they offer no-strings attached stays to a handful of writers and 2d artists for one week each during their off-season in the winter. You can apply here. Forestburgh – Billed as the oldest continuously operating summer theater in the state, they operate under an agreement with the Actors’ Equity Association: professional actors (often from Broadway) are employed here, while non-union professionals can work side-by-side with them as they earn credit toward their eventual union membership. They put on Broadway-style musicals and plays, youth theater productions, and musical cabaret in the adjoining tavern. Roxbury – The Roxbury Barn isn’t an event venue that hosts the occasional wedding while also running a restaurant and bed and breakfast and horse barn; THEY DO WEDDINGS. For over a decade, they’ve made it really easy for people to have a perfect Catskills wedding; it sounds like they have everything covered (like electricity and bathrooms) that not all rustic venues have. Bloomville – Billed as a “refreshingly ragtag cafe” that sources everything on the menu from within 10 miles, this business is both an acclaimed restaurant and a hub for everything Delaware County. They run foraging workshops and host community events in their building, which also features a few rooms for rent upstairs. And they do the cool sign thing that Prairie Whale does in Great Barrington! Great minds think alike. Hancock – In 2008, the New York Times said that French Woods, along with Stagedoor Manor in Loch Sheldrake (and some other camp in Michigan) were the “gold standard” of performing arts camps for kids. Oliverea – Once again, we’ll defer to Mike from Hike the Hudson Valley: “Awesome this place is; A well-kept secret, it is not.” We’re about to hit prime leaf-peeping season, and this is one the best places to witness it. For an Instagram trifecta, also stop by the Phoenicia Diner on the way there and Peekamoose Restaurant & Tap Room on the way back! Phoenicia – A performance venue, artist residency haven and wedding hot spot located on 115 acres. The campus can be rented year-round, and has great views, an organic vegetable garden and wildflower field, nightly campfires and an idyllic post and beam studio. Artists are prepared dinners with food sourced from the garden and neighboring farms by chef Ethan Knechel (Reynard & Spotted Pig). Their performance season, titled Watershed Laboratory performances run March through October with artists such as 600 Highwaymen, International Contemporary Ensemble and Sibyl Kempson. Wurtsboro – Like many of the successful businesses on this list, Crystal Connection is both old and new; it’s housed in in a former Methodist Church that was also a legendary restaurant in Wurtsboro before becoming its current form. Whether you’re into crystals or not, it is worth a visit to see so many gems, large and small, in one place. Livingston Manor – This is the largest pond in the massive Catskill Park, and we decided to give it its own entry because it has a following all its own. They allow swimming, with campsites, a picnic area and boat rentals. If you’re ready for an adventure, there are waterfalls nearby that you can track down. Wawarsing – The Ashokan Reservoir gets more attention as an NYC water provider, but the Rondout Reservoir is no slouch; it’s part of a network that provides half of the city’s daily water consumption. There’s fishing on the water, and some biking to be had around the reservoir, but there’s not much information online on where to get started with all of that. Seems like a big opportunity! Oneonta – An 8,000 foot bar/lounge that occupies part of what used to be a Sears in Oneonta. In 2013, the owner said, “We are a nightclub 26 weekends out of the year. All of the other times we are opened, we serve tourists and families and the parents’ of college kids.” This location is popular for college group events like formals and date parties, during which it’s traditional to take a photo near the “Jimmy T’s” sign. Oneonta – Nice going, Oneonta Parks & Recreation! It’s home to Perfect Game College Baseball League’s Oneonta Outlaws team; which is basically a collegiate all-star team. They count big-leaguers Mike Fiers and J.D. Martinez as alumni, which is pretty cool. The park also has all kinds of courts, a skateboarding course, and a spin through recent pictures shows they had lots of hot air balloons for Labor Day Weekend. Notably, the park is also home to the main concert event of OH-Fest, a collaborative day for the SUNY Oneonta and Hartwick College school’s packed with vendors, food, and music. The concert has featured big-name artists like Panic! at the Disco, Mac Miller, and, most recently, Jesse McCartney. Greenfield Park – A Yogi Bear-themed RV/cabin resort, Catskills-style! They offer activities like arts and crafts and candy bar bingo for the kids. Narrowsburg – The Delaware River crosses five states; New York, New Jersey, Pennsylvania, Maryland and Delaware. There’s a section of it that’s geo-tagged in Narrowsburg, so we’ll focus on that bit. There’s river access there, with boating, tubing, fishing and swimming allowed. Ellenville – CYM is one of five youth camps run by the Ukrainian American Youth Organization. The camps provide “Ukrainian discovery experiences” with all the trappings of regular summer camp: swimming, team sports, hiking, arts and crafts. CYM has been here for 62 years, and this year, campers got to hang out with Ukrainian rock stars Antytila! Neversink – This reservoir project was started in 1941 and finished in 1953. The ironically-named hamlets of Neversink and Bittersweet were sacrificed to the Drowned God to make this happen for New York City’s water supply. What is dead may never die. Neversink is a little less accessible than the other reservoirs but there is fishing allowed. Big Indian – Peekamoose is an old converted farmhouse and is cozy AF, right down to the fire pit outside. Like some of the other popular restaurants on this list, Peekamoose rides that line of combining the rustic aesthetics of the Catskills with fine dining chops, locally sourced ingredients and strong cocktails. Oneonta – Also known as “The Sip,” they were recently named one of the top 15 places to “get cheap drinks and party hard” by New York Upstate. Try every beer available at the bar and get your photo on the wall and a free Sip & Sail t-shirt, or get some friends together for a shot-ski – a line of shots attached to a single ski! Wurtsboro – The owner of Bashakill has a cool story: he did most of labor himself to plant his vineyard, move his winery operation out of his garage, and build a cellar and tasting room. He made it happen because his tech job was outsourced to Ukraine in 2005. Bashakill makes their own beer and wine, there’s a pizza oven on premise and they regularly have small music events and yoga in the vineyard every Saturday. Callicoon Center – Historic hotel, charcuterie plates, and tiny bowling alley with hand-set pins. GIMME. Fleischmanns – This was the summer cottage of THE Fleischmann yeast family. Most of the Instagram photos are of weddings that take place on their 32 acre property, but they also run the gamut of other curated events. They made a huge splash on Mashable, Buzzfeed and the like as part of a listicle of Disney Princess Castles; their dining hall looks like it could’ve been in Beauty & the Beast. Riggsville – This is one of the best bang for your buck waterfalls in the Catskills; it’s not totally overrun like Kaaterskill, it’s a quick 3.5 mile out and back hike, and you can take a quick dip in the falls without risking your life. 10/10, would go again. Roscoe – Roscoe Beer Co. is a relative newcomer to the NYS beer scene, but they’re already making waves; this year, they tied Brewery Ommegang at the Taste NY Craft Beer Challenge as the state’s best brewery. The beer that got them there was their Two Headed Stout. While you’re in Roscoe, check out the Roscoe Diner, which didn’t quite make this list but is an absolute treasure of the old Catskills on Route 17. Tannersville – Bacon egg and cheese on a donut. And they’re really nice, even though the shop has nothing to do with the TV show. It’s a great appetizer and/or dessert when paired with Mam’s Boy Burgers/Pizza. Bovina – Opened in 2014 in the space that used be Two Old Tarts bakery, the Brushland Eating House has put Bovina on the map for food tourists. For people who want the full experience, they even rent an Airbnb upstairs from the restaurant. East Durham – Eight slides, five play areas, and four food stands. It’s part of a larger resort called The Country Place, which grew out of the Shady Glen Hotel that was here in the 1800s. Port Jervis – Rejervination, baby! This hotel was built in 1890, when Port Jervis was a transportation hub between New York, New Jersey, Pennsylvania, the Delaware River, and a railroad that went all the way to Buffalo. There’s also a vintage-looking restaurant and catering side of the business. Tannersville – Mama’s Boy Burgers opened in Tannersville in 2015, and serves up salivatingly good grass-fed burgers. Janes Ice Cream, and lots of other locally-sourced favorites. For dedicated Mama’s Boys out there, there’s also a Mama’s Boy Pizza that opened up down the street. While working on this post we noticed some interesting photos and happenings; these aren’t necessarily the Most-Instagrammed Places, but are certainly notable things that happened in the last year. Mount Tremper – The Beautiful Destinations team (with almost 10M Instagram followers) was tapped by I Love New York to do some on-premises, sponsored content in the Catskills. They did some things at Kaaterskill Falls and Hunter Mountain (#1 and #2 on this list), but one of the photos they took was this gem of the Catskill Mountain Railroad, which got liked almost 200,000 times and was re-posted by other accounts like Earth Focus and We Live to Explore. It was by far the most liked photo of the year in the Catskills. Narrowsburg – Menswear blogger Adam Gallagher took a trip to the Catskills and made a bunch of content about what he did here. One of the places he checked out was Maison Bergnone, an antique garage which had close to 150 photos taken there in the last year. He also checked out Nine River Road in Callicoon and The Arnold House. Bovina – Theron Humphrey is a photographer who, in 2012, raised $16,000 to fund a year’s worth of traveling across the United States with his faithful dog Maddie. The project was called “This Wild Idea,” and Maddie became an Internet superstar, leading to a side project called Maddie on Things that led to an appearance on the Today Show and a book deal. A few years and 1.2M Instagram followers later, Theron and Maddie are still trucking along; they took two photos of their stay in an old school house in Bovina that was renovated into a tiny house.